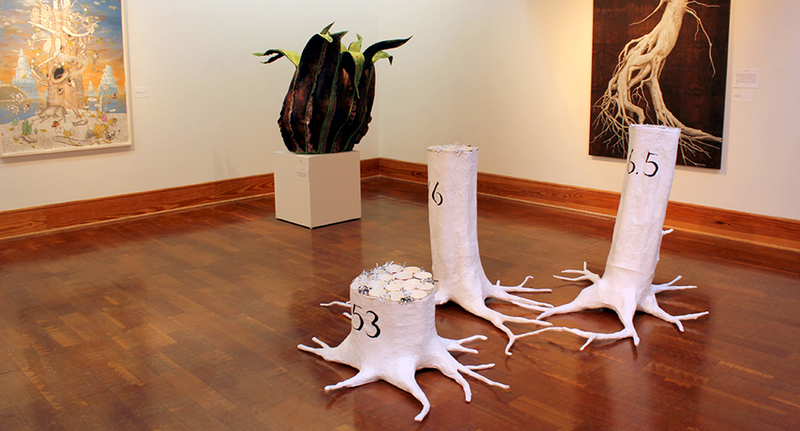 “Dendrology” an exhibition at the Noyes Museum addressed the nature of trees in the broader context of the natural world and in the realm of human society. “Tree Constitution” is made of coffee cups and paper mache. The numbers on each tree correspond to the statistics represented in the information gathered from Wikipedia. According to Wikipedia, over 6.5 million trees were cut down to make 16 billion paper cups used by US consumers in 2006, using 4 billion US gallons (15,000,000 m3) of water and resulting in 253 million pounds of waste. *Please be responsible when consuming your morning coffee and bring a recyclable mug.